Have you been injured in a Boating Accident in Tampa Bay? It may be the dead of winter elsewhere, but here in the Tampa Bay area, it’s just another day to go fishing or enjoy the water. Even when the wind gets a bit chilly, you can see people out on the water fishing, boating, and even swimming. Maybe that’s why Florida ranks as #1 for water sports activities in the whole country. But with all those water activities, there are going to be injuries. When someone gets hurt while boating or entertaining on the water, there are specific considerations to think about. At Roman & Roman, P.A., we are here to help injured people all over the region. Give us a call to speak with someone at no cost. Boaters aren’t the only ones taking a risk on the water. Here are a few typical examples of boating injuries that happen around the Tampa Bay area. Boat crashes – When boaters get distracted or ignore channel markers, they can end up colliding with each other, causing serious injuries. Jet ski injuries – Jet skis are notoriously risky watercrafts already, so it’s even worse when distracted or intoxicated boaters fail to see them. Much like motorcycles, these watercrafts are smaller and harder to see. Nevertheless, it’s everyone’s responsibility to safely operate around them and be on the lookout. Swimmers/divers – For people snorkeling or scuba diving around Hillsborough, Pinellas, and Manatee Counties, it can be extremely dangerous because of negligent boat operators who fail to notice the diving flags or blast through clearly marked swimming areas near the shore. Dock/Piling collisions – Sometimes boaters (usually alcohol impaired) fail to pay close attention and plow into pilings, docks, and even piers, sometimes killing people and causing incredible property damages. Falls overboard and propeller injuries – Some boaters are so careless they injure their own guests and passengers. 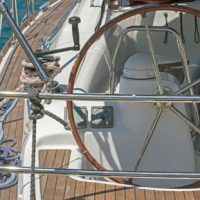 Whether trying to show off or just not having the proper safety training, these careless boat operators may accelerate too quickly, fail to keep an eye open for where passengers are sitting, or forget to check the stern before powering up the motor. These things can lead to tragic injuries and fatalities. According to the Department of Fish and Wildlife, Florida saw 766 reported boating accidents in 2017, with a total of 67 people losing their lives as a result. Much of the pain and misery these accidents caused could have been prevented through proper boater safety training, less alcohol consumption by operators, and better awareness of the hazards involved with operating a vessel on the water. Depending on where the accident took place, you may have rights under both Florida law and federal admiralty laws. To discuss your options, call Roman & Roman, P.A. today. Our Clearwater personal injury lawyers have been helping injured Floridians throughout the Tampa Bay area for more than 30 years. We don’t charge fees upfront, and it’s always free to speak with an attorney about your case. So call today.